Maladministration? What do you think? Wishing you all a happy Easter. We will be doing lots of work over Easter to prepare for the return of parliament on the 28th April. The Guardian article on Workfare: Polly Toynbee explaining what we already know is happening with AtW. The changes to Access to Work will falsely show that there are more disabled people working (when they are in fact on work placement) to skew the unemployment figures, whilst the government will be able to claim that they are supporting more disabled people into work. A win, win for the governments publicity department… A lose, lose for Deaf and disabled people. We are pleased that the government is starting to be exposed for the way they falsify figures and that there is an increase in public awareness of this issue. We need to stop the changes to Access to Work. If you haven’t yet done so, please send a link to our campaign video to your MP. This is the first of our campaign videos. At the end, you will see others in this series that you can watch and also a link to sign the petition. Please send this video out to your MPs, organisations, and individuals! 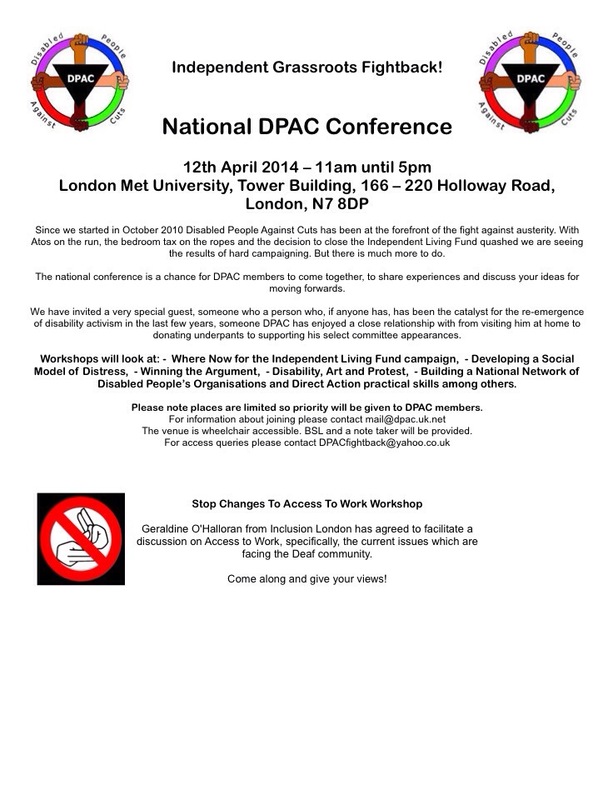 The Stop Changes To Access To Work Campaign will be holding a workshop at the National DPAC Conference on Saturday 12th April. Geraldine O’Halloran from Inclusion London has agreed to facilitate this. Come along and give us your views about what’s happening with Access to Work! The following information was sent to us, and though not within the remit of our campaign, the attitudes expressed are extremely concerning. We wanted to ensure as many people as possible get to read it.